It’s a beautiful place to stay, but one observation we had is that you must take great care when entering the water here because of the thousands of sea urchins that cover the sea floor. So many of all sizes that even with beach shoes you’ll find it challenging to make it to an area where there are few enough to not worry. But don’t let a creature of nature keep you from enjoying the rest of the beauty Matemwe Beach offers. A bungalow close to the beach, or on the beach, takes the worries away and puts a smile on the face of the most stuffy traveler. 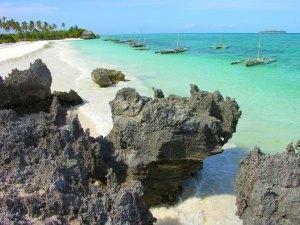 A small village on the northeast coast of Unguja, Matemwe is actually ten villages in one. As a tourist, you’ll never know – but Matemwe is a mixture. With 7900 locals, the seaside town depends greatly on fish and seaweed farming. It has been hit and miss as far as locals figuring out what works and what doesn’t. I suppose that’s the way it is all over the globe. If you could, you know you’d love to find a bed and breakfast close to or even right on the shore of the sea. Guest homes, as they’re known here in Matemwe, accommodate, and most of them hug the sea. Close your eyes. Take a deep breath. Once Matemwe was totally covered by large, natural forests. With the increase in population, the forest was reduced. Once poverty set in, the forests use was unsustainable. You’ll notice only bushes in Matemwe. But there is plenty of beach and supreme diving close by at Mnemba. Another thing that is abundant in Matemwe is silence. Your transportation drops you off and you can already hear the breeze through the palm leaves, the surf gently washing ashore. Most of the hotels are facing Mnemba Island, where diving is the sport. The people here are friendly and accommodating. They will enjoy talking about family and island life. But you’ll find them hard workers. 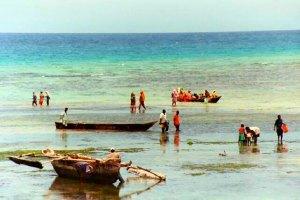 For example, when the tide goes out, local men of Matemwe go out in their boats (dhows) to fish within the reef. The women also work at low tide, harvesting seaweed – even if low tide is in the middle of the night. 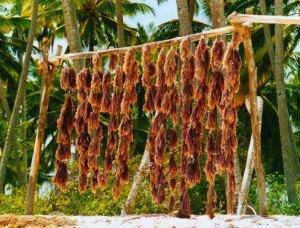 From Matemwe, fish is taken to markets around Zanzibar, but the seaweed has a more dramatic voyage. It is dried on racks, then sold for around 80 cents a kilo to exporters who ship it off to Asia. You can arrange diving from all the hotels and guesthomes around Matemwe. But even if you don’t dive – here’s a tip: The hotel can arrange a boat for you to go out to the reef area where the snorkeling is indeed World Class. You will see a great variety of marine life and coral for as far as you can see. Mnemba Atoll is the pristine dive paradise where the people who know are headed. The Mnemba Atoll surrounds the island, once called by Condé Nast Traveler – one of three most romantic ocean destinations in the world. Mnemba means “octopus head” in Arabic. Expect great expanses of snow white beach studded with occasional rock outcroppings which contrast spectacularly with the sand, sky and sea. 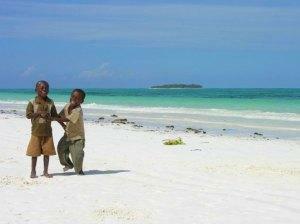 Best time to visit Matemwe Beach is July through to March, with high season October through to March (kaskazi monsoon). Stress-relieving tip: Enjoy the beaches of Matemwe at night. Yes, the Milky Way is breathtaking on Matemwe Beach because there is literally no light pollution. You will be thrilled and in awe as you take in the stars and beauty of God. Notes – if you rent a car, watch for local police stops. Present your papers and be on your way. If you have any problems, demand to go to the police station.